We recently published a blog post outlining the differences between trussed enclosed track, trussed plain track, and I-beams. As of late, we’ve received a lot of inquiries about the differences between each type of track, along with how those track types impact the construction and use of certain overhead cranes. Although most manufacturers use enclosed track (trussed and plain) for many different systems, including workstation bridge cranes, workstation jib cranes, monorails, and plain enclosed track cranes, we’re going to focus this particular post on the differences between workstation jib cranes and standard I-beam jib cranes. There’s a lot of confusion surrounding workstation jib cranes and what differentiates them from standard I-beam jib cranes. It’s important to note that enclosed trussed track systems are often referred to as “workstation”, which can be confusing considering that the word takes on multiple meanings in the manufacturing industry. With that being said, workstation jibs include the enclosed trussed track profile (see our recent blog post about enclosed track profiles and I-beams); the track is used in place of the standard jib boom, which utilizes an I-beam instead of enclosed track. Workstation jib cranes are extremely ergonomic, and they’re perfect for easy transfer of repetitive loads because they tend to be even faster than motorized jib cranes. They’re mostly used for lighter loads than traditional jibs, and they’re very affordable in comparison. Although workstation jib cranes use the same enclosed trussed track profile as workstation bridge cranes, their overall functionality and capabilities are much different. Workstation bridge cranes are capable of lifting much heavier loads than workstation jib cranes because the top tube that sits above the shaft bears most of the load weight on a workstation jib. Additionally, workstation bridge cranes have a much higher track depth, making them sturdier for heavy loads and capable of greater spans. 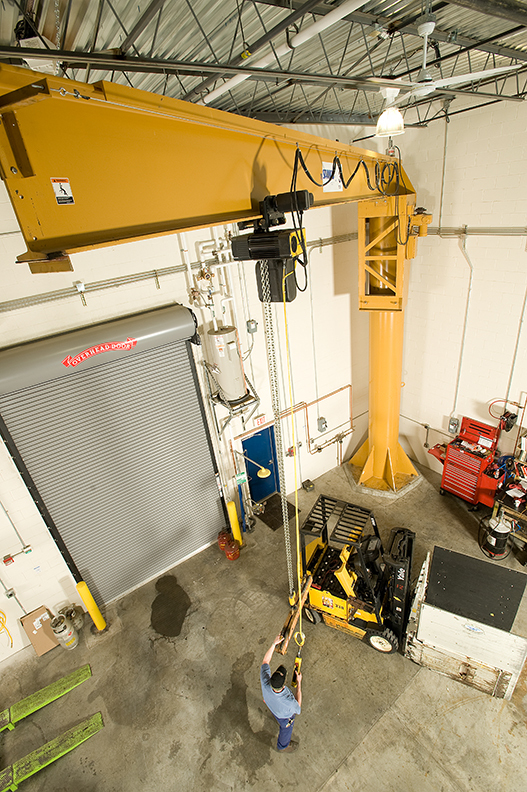 Workstation jib cranes are the perfect solution for applications requiring fast lift and transfer of lightweight, repetitive loads. Standard I-beam jib cranes are designed using tubular steel for the mast (on a freestanding jib) and an I-beam for the boom. Additionally, wall-mounted jibs are designed using two standard I-beams: one that attaches to the walls with mounting brackets, and one that is used for the boom of the crane. Freestanding jib cranes offer 360-degree rotation, whereas wall-mounted systems only offer 200-degree rotation. 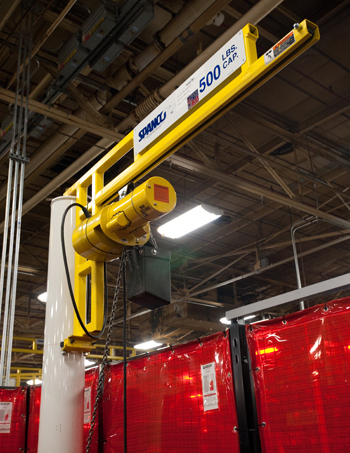 Standard jib cranes can lift much heavier loads than their workstation counterparts; with a maximum capacity of 20 tons, they can span up to 50-feet depending on your facility, mounting preference, and other dimensional specifications. These systems are perfect for lifting and transferring heavy loads at longer spans and provide multiple installation and accessory options to accommodate your individual application. 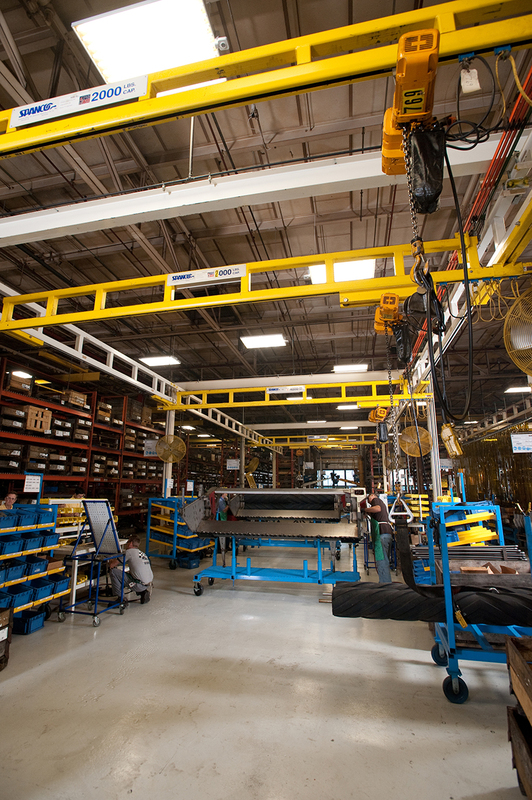 All of our cranes—plain or trussed enclosed track and I-beam models—can be fully customized to meet your specific needs. But, as a general rule, each type of track/boom serves a specific purpose for a specific type of operation.